Pictured at the groundbreaking, from left: WCM Executive Director Tracy Kay; County Executive George Latimer; former WCM board president Laura Lavan; Business Council of Westchester CEO Marsha Gordon; board member Marc Oxman; board president Carolyn Carr Spencer; former board president Corinne Zola; and board members Kim Jeffrey and Anthony Salva. In Roman history, March 15, has long been a day to beware. 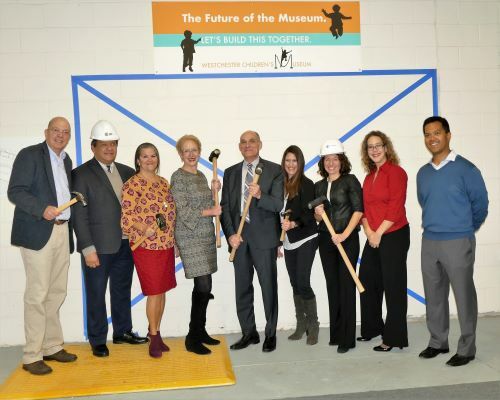 But in Rye history, from this year forward, it will be remembered as the day that the Westchester Children’s Museum broke ground on the renovation of the North Bathhouse. The Museum will remain open during the conversion of the National Historic Landmark into a sunlit, year-round facility. Director Tracy Kay noted that the infrastructure improvement will increase operating space threefold and afford immense opportunity for hands-on exhibits and STEAM programming not found anywhere else in the region.